I can make a computer bend to my will, I can make MS Excel obey my every command, I speak in several computer languages, BUT, my kingdom for a stapler that works every time! Staplers are my office nemesis, invented in 1866 by a man, for the sole purpose to taunt me. Interestingly enough the staple remover was not invented until 1930’s, patented by a man, but I’m sure a woman had something to do with it. It’s now 2018 and staplers come in all sizes and shapes, but not much has changed. 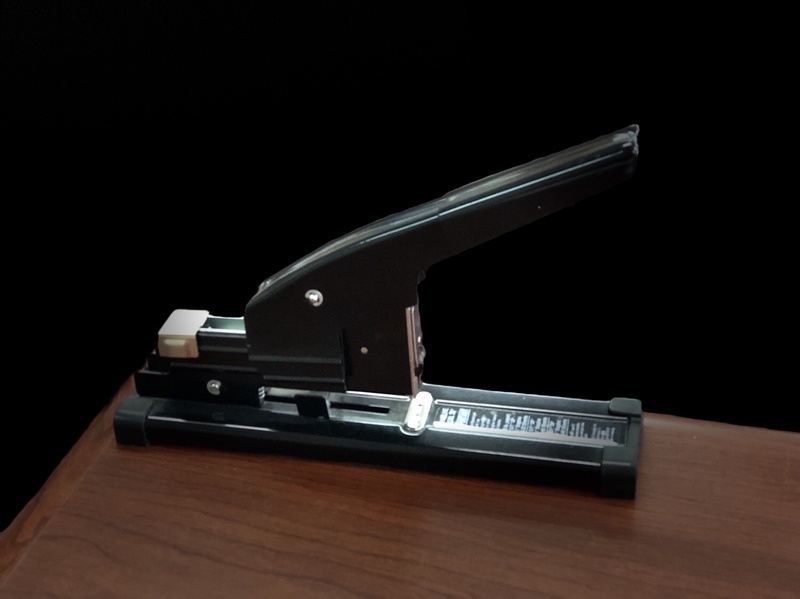 From the little pocket size staplers to industrial monsters, from looks that have not changed in 100 years to stiletto shaped staplers, still, they taunt me. For a short time I thought I found the Holy Grail. A stapler I liked. It was one of those ones that stand on their nose, gray in color, nothing extra. It worked almost every time and we had a good relationship. But in the end, it to, taunted me. One day it stopped working so I opened it to see that it only had a three or four staple stack left in it. When I went to dump them out and give it a refill the stack would not just fall out of the device, so I put my fingernail under it to loosen it up. As soon as I touched the stack it flipped on it’s side and dropped into the firing chamber. I gathered all the pieces-parts from the desk, floor, and my lap and put it aside for the day. This heavy duty model has a face only a Kaiju could love. It taunts me too. I have used several different staplers since then, all of them taunt me. The stapler currently on my desk is a Swingline made of heavy pot metal (pictured in the head of this post). It works well, rarely jamming, and I can use it as a weapon if needed. I’m still searching for the perfect stapler. If you hear a woman’s voice at you local office supply shop asking “What is the airspeed velocity of an broken stapler?” That’s just me, on my Quest for the Holy Grail of Staplers.